I’m working on a C++ product that has a series of client executables that need to talk to a server executable. And they all share a lot of common code. The traditional approach to build and debug this pattern is to create a library of the common code in one project, a separate server project and another client project, then jump between windows to edit and compile where needed. But I am often coding on my trusty 13" MacBook Air screen and it’s just too tiny to have all these Xcode windows open with their console windows visible. I even prefer this on the 27" Display where I can see documentation and other windows nearby. It turns out that Xcode does support running multiple targets simultaneously, and you can get away without the additional library compile. Take this spike I am working with. 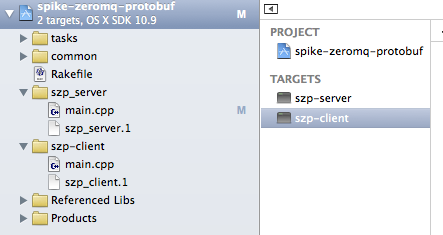 It has two targets, szp-server and szp-client representing the server and client components. The common code is in the common folder. Each file in the common folder is assigned to both targets (in the File Inspector Panel) so they get caught by both project compiles. Each target also has a scheme, so each can be run as normal. The simple trick is that I can switch to the szp-server scheme and launch it (regular run or instruments), causing the szp-server to start and display its output in the console window. I can then leave it running while working on the szp-client. I can select the szp-client scheme, edit, compile and run it as well. Xcode treats the second run the same as another thread. 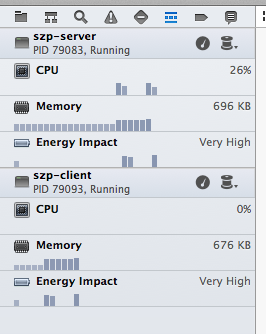 You can see its CPU and memory use, run one or the other in instruments and even switch console logs, all in the same Xcode window. And the best part. One window, easy on the small screen and no switching windows.